You can use your restaurant point of sale system for much more than ringing up orders! Point of Success includes features to help you sell more to your existing customers and get and keep new customers. With Point of Success it’s easy to decide which promotional activities, offers or publications generate the most financial benefit. Informative reports support every marketing spending decision with facts rather than guesses. Create a list of currently available coupons, discounts and promotions. Track customer response, redemption details and effectiveness of every promotion. It is a commonly held belief that a business will spend five times more to get a new customer than it needs to spend to get comparable revenue from an existing customer. Point of Success gives a restaurant the information it needs to continually communicate with existing customers, encouraging them to order more and order more frequently . Recognize customers with a greeting or special offer on their birthday. Store the birth month and day on a customer account for birthday marketing offers. The value of a new customer is important, but the lifetime value of an existing customer is even more important. Many restaurants expend a great deal of time and money to get new customers to the exclusion of improving relationships with customers they already have. If a restaurant spends $500 to get 30 new customers who each place a $15 order, the total new revenue will almost meet the cost of the advertising. The problem is that if 25% of these new customers order again, these new customers are profitable only if each retained new customer orders three or more times. Balancing new customer marketing activities with offers directed to existing customers is vital to a restaurant’s success. Restaurants using Point of Success software know their customers and their buying habits, giving them the power to emphasize existing customers in their business-building activities. Every restaurant manager recognizes their customers who order consistently. 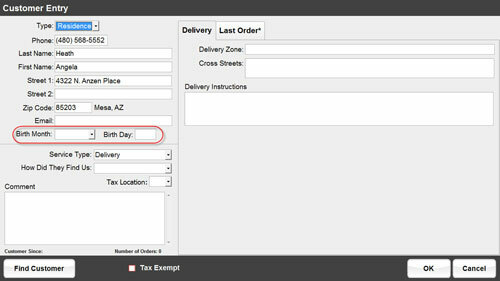 They know that the majority of their orders every day are placed by existing customers. Existing customers are the most consistent, reliable source of regular business. Point of Success pinpoints good customers so you can communicate with them more frequently and more effectively! Identify customers by their longevity, their order frequency, their lifetime value and more. A good customer is worth the extra care it takes to keep them coming back again and again . 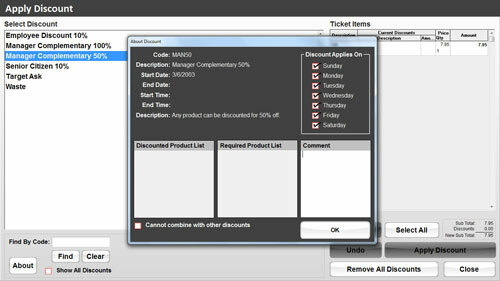 Entering discounts and tracking promotions is easier with Point of Success’ coupon and discount tracking features. Each coupon or discount is created with valid days, dates and times, how to calculate the discount, and the items to which the discount applies. Point of Success makes it easy for a restaurant to encourage add-on of extra items with every order. 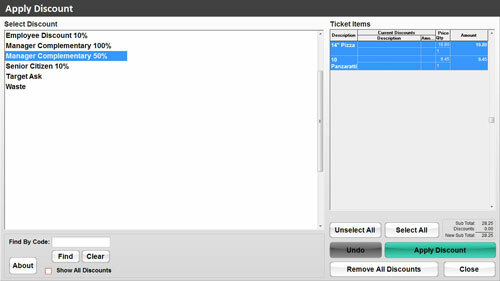 When offering incentives to servers or order taking staff, sales achievements can be tracked for add-on items. Restaurant managers are sometimes unaware that customer relationships are critical to a successful restaurant. The loss of a dissatisfied customer is a huge cost. When a customer disappears the most controllable cause is dissatisfaction. Contacting an inactive customer repeatedly and with increasingly attractive offers to become active again is the most effective marketing expenditure a restaurant can make. Point of Success offers reports detailing which previously active customers have not ordered in a specific period of time . This information permits contacting of customers with coupons and other enticements to order again. When active customers stay inactive even though they have been offered generous incentives, it’s time for a manager to contact the customer personally. Inactive customer follow-up gives a manager first-hand experience with customer complaints. An informed manager can easily judge the quality of their restaurant’s food and service, then make changes to keep customers happy. Generous problem-solving attention from a manager is often all that’s needed to transform a dissatisfied customer into a raving fan. Keeping managers informed and involved is the best way to improve a restaurant’s success. Busy managers spending time operating the restaurant are far less effective than managers who are in touch with their customers!